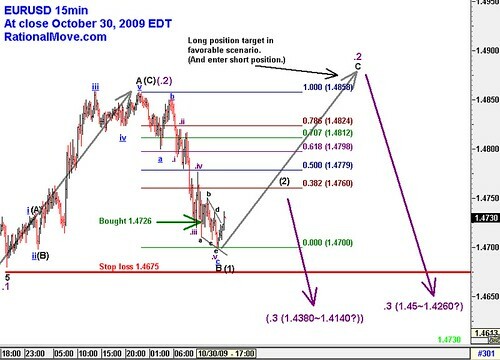 Elliott wave analysis of the week – October 30, 2009, originally uploaded by Rational Move. Sorry for the crowded and small image. Here is the larger sized image. On Thursday, October 29, the equity market rebounded with positive GDP, and so did EURUSD. This short term uptrend clearly had the characteristics of impulse wave black A, and it went all the way to 50% retracement of the purple .1. In Elliott wave principle, the corrective 2nd wave should be a zigzag ABC wave with A and C being impusive, and B being corrective. What I would had expected is B to be very weak gradual trend down, not exceeding the starting point of A (=1.4680 and marked purple .1). What made me cautious was this B looked like an impulsive, making gap around 1.4780. So, I was waiting at least the price to bounce back significantly in 15 min chart, now marked as purple iv. So I assumed the bottom is near. I gave a shot and bought 1.4756 with 1.4710 stop. The price action slowed down as you can now see as the ending diagonal (black a, b, c, d, and e), but continued to go down. So I thought the end is near and bought another unit at 1.4726. EURUSD kept going down gradually, and I was thinking hard what to do with my 1st and 2nd positions. As a discipline, I should never move the initial stop loss position in the direction of increasing the loss. So I kept 1.4710 cover for the 1st unit. 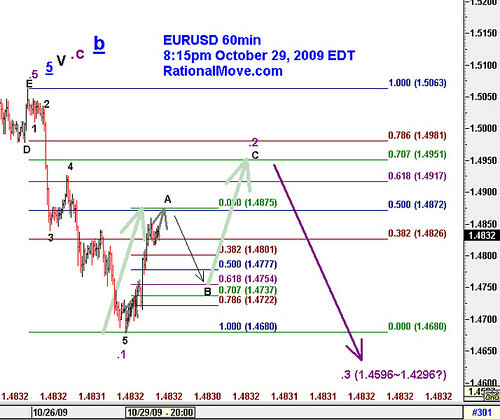 My hypothesis of EURUSD currently being in the 2nd wave zigzag up won’t be rejected fully until 1.4675 beaks. So, I decided to keep the latter unit bought at 1.4726, and set the stop at 1.4675 as I had thought very beginning. In the worst case, both units would be covered with loss, and in this case, the total loss would be 97pips. October was not a good month for me but I was already 120+pips ahead, so I approved this idea. Now I had nothing to do but sit back, and to see what happens. 1.4710 traded, and my 1st unit is covered with 46pips loss. My 2nd unit is still alive. I labeled this chart this morning, with 2 scenarios. The second scenario is labeled with brackets, and it is less favorable than the initial scenario I had constructed before entering the position. In the second scenario, we are already in mighty 3rd wave down, which is not good news to me. But within the 3rd impulsive wave, we should see 5 wave structure, and we should have just witnessed the end of the 1st wave, labeled as black (1) with ending diagonal (black a, b, c, d, and e). Ending diagonal usually is a reversal sign, at least to where it started (labeled as purple .iv). So, even if the second scenario will be the right answer, I might still able to cover the 2nd unit with ~50pips profit, that would make up the loss of the 1st unit. Because this ending diagonal happened at the very close of the Friday market, I am not sure if the reversal predictor aspect of ending diagonal would be true this time. So keep my 1.4675 stop order tight to be prepared for the worst case scenario. $EURUSD I was wondering what news would cause short term reversal to up trend, originally uploaded by Rational Move. Looking back this week, passing the opportunity of almost 400pips trade was certainly not a good experience, but there wasn’t a valid entry point based on my current trading rule or life style: I do not buy/sell break b/c I have not come up with good way to measure and set appropriate stop loss line in that case. Risk and max loss have to be clearly defined in every single trade I make. Anyways life goes on, and so does market. I was wondering what news would cause this desperate and god-knows-why risk aversion downtrend to end, and very positive GDP was the answer. Assuming my wave count and Elliott wave’s prediction of the bear market are all correct, today’s GDP news was the killer. People now thinks recession is over, politicians will push more towards reducing the fiscal deficits, expectation for economic growth and employment recovery just gets higher. They all push equity lower with greater disappointments in coming months. We can say wave 1 (from 1.5063 to 1.4683) is over, and almost completing A wave up. I would expect corrective B wave down, then impulsive C wave up. So my plan is to enter long at the end of B wave down. The price level I would be entering is not very clear yet, but should be between 1.4722 and 1.4777, and I would aim this long position to carry us up to 1.4917 ~ 1.4981. The stop loss order, of course, will be set at 1.4675, or just below the end of purple .1 wave. This makes max loss of about 47 to 98 pips, and expected gain to be 140 to 259 pips. It’s a great risk reward ratio. After this long trade is done, I will enter short position, possibly from 1.4917~1.4981 level. In this video, Todd Gordon talks on the discipline of trading. What is the best action to take advantage of the scenario you have drawn? On what condition your hypothesis get invalidated, and you should take the loss cut? In the worst case scenario, how much loss would be realized, and can you take it? When do you take profit? What is the best scenario? Worst? Any other alternatives? What would you do to each scenario? You have to be able to answer all these questions before exposing your valuable assets. Disciplined traders always have clear answers to those questions. My trading recorded greatly improved after I became super strict on keeping hypothesis driven trading. Elliott wave principle helps me to construct the hypothesis, and make action plans to any scenario before I submit the orders.